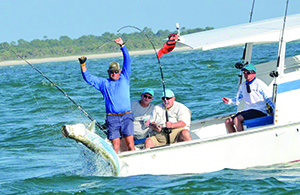 BY SUE ERWIN – When it comes to catching tarpon, some credit experience as the key. Others claim luck. Many say it’s most likely a combination of the two. Whatever it is, Capt. Waylon Mills has got it and he is setting the Pass on fire. Boca Grande native Capt. Waylon Mills has recently had a winning streak when it comes to catching silver king. He won the Howl at the Moon Tarpon Tournament, 2018 Ladies Day and the World’s Richest Tarpon Tournament, all in the past few weeks. There were 29 teams that fished in the two-day all-release tournament held on May 18 and 19, and the tarpon were hungry so competition was fierce. Waylon’s team on the Blaze caught a total of 10 tarpon and took first place, along with a check for $34,800, tournament rings and trophies. Waylon himself took home a first place captain’s trophy, as well as a 2018 World’s Richest Tarpon Tournament ring, donated by Barbara Anne’s Jewelry and Repair, a custom AR-10 Cal. 308 and a Yeti cooler. This was the 36th year the tournament took place. The team consisted of family members Cappy, Sally, his wife Angie and his cousin Sam. “That was the first time I’ve fished with all family in a World’s Richest,” he said. Waylon said he didn’t do anything different than any of the other captains out on the water. The captain has fished in fresh water but prefers to fish the water surrounding Boca Grande. He said he normally chases tarpon all the way through August. He uses a combination of shrimp, crab and squirrelfish as bait. Waylon was born in Fort Myers, the son of Sybil Joiner, whose family hails from Boca Grande, and Billy Mills, whose family is from St. James City. The youngest of five children, he has three sisters: Melina, Selina and Monica; and one brother, Willie. He is a Florida boy, born and bred, and remembers being three years old trying to hook a mangrove snapper from a dock in Marathon, Florida. The family moved back to Boca Grande in 1989, and Waylon has been successfully chartering fishing trips in area waters since then. Waylon’s great-grandfather used to fish Boca Grande Pass in the old rowboat days, when the small vessels would sometimes tie themselves together to form “daisy chains” while fishing for giant tarpon. Fishing runs deep in his family, and after 25 years as a guide, he’s seen his share of the great silver king. He won first place in the 2009 Boca Grande Chamber of Commerce Ladies Day Tarpon Tournament, making four women very happy. He won the Boca Grande Fishing Guides Association Tournament in 2010. He also took third place in the 1999 World’s Richest and took home the Jay Joiner Memorial Belt Buckle. Waylon didn’t have plans to become a professional fishing guide. He was a baseball player – a very good one – who had a chance to make his way up to the big leagues. After graduating from St. Cloud High School in Osceola County and Flagler College in St. Augustine with a degree in psychology, he started exploring his options in semiprofessional baseball. In college he was scouted by many agents. Several of them were watching when he hyperextended his elbow during a game. The next year he lost all but two of those scouts, and one sent him to an independent league in Zanesville, Ohio. With a week-and-a-half to go before he took that next step, he blew out his shoulder. 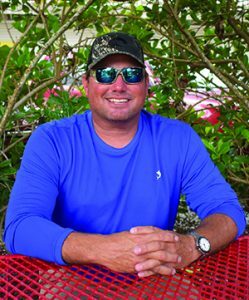 Waylon started his Boca Grande charter fishing business in 1993. His degree in psychology has come in handy over the years, as dealing with clients can sometimes be challenging. Having spent the first nine years of his life on the southern tip of Florida in Marathon, Waylon said he was fishing more than almost anything else. So when the family moved to landlocked Osceola County, he wasn’t sure what to do at first. He soon learned that the equivalent to fishing in southern Florida was hunting. His dad bought a ranch there. Although it was a different environment, it didn’t take long for the “water boy” to enjoy the land with all the hunting in the area. While he admits to doing some freshwater fishing there, it’s easy to see he much prefers spending time in the saltwater. The family moved back to Florida in 1989. A few years later, Waylon met his wife, Angie, at PJ’s Seagrille on Park Avenue on the island. Betsy Joiner introduced them. The couple have two children – Zoey, 12 and Owen, 9 – who both love to fish. Zoey attends L.A. Ainger Middle School, and Owen is a student at The Island School. The family enjoys fishing together when Waylon isn’t busy with the charter business. Both kids will be fishing with their dad in the Gasparilla Island Kids Classic Tarpon Tournament on June 2. “Owen fishes every minute he’s not in school or on the baseball field,” said Waylon. Both children inherited the baseball gene. Zoey plays softball and Owen is in a baseball league. Waylon is also registered and ready for the upcoming Ladies Howl at the Moon Tournament that is scheduled to take place on Saturday, June 9. To book a charter with Capt. Waylon, call (941) 270-0291 or visit captwaylon.com.